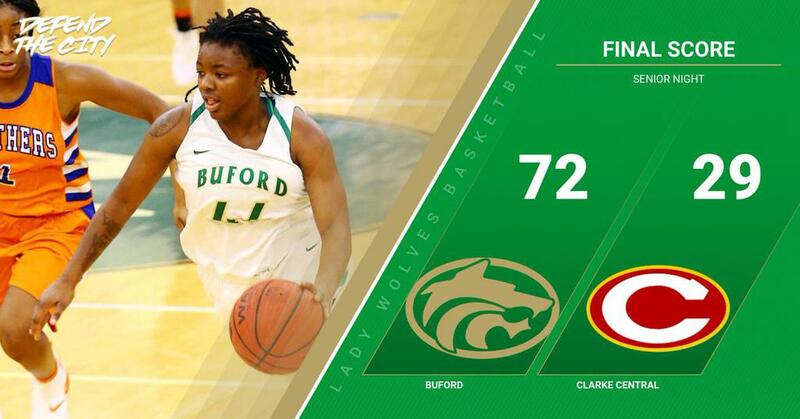 The Lady Wolves checked off many boxes this past Friday night at the Buford City Arena. They secured the top seed for the region 8AAAAA tournament that begins this Thursday, they finished with one of the best regular season records in Buford history, they won a very emotional senior night for our "Leaders of the Pack" and they played a total game on both the defensive and offensive sides of the ball game. The Lady Wolves sprinted out of the gates and shocked the one region loss visitors with a 17 to 9 lead and then never looked back as they outscored the Lady Gladiators 27 to 5 in the second quarter. The third quarter was an even better defensive effort as they held Clarke to 0 points while the Lady Wolves scored 20 during this period. After pulling all the rotation players for the fourth and final quarter, Clarke managed to score 15 points to bring the final score to 74 to 29. This brings the Lady Wolves record for the season to a sterling 22- 2 and their region record to 10-0 for the season. Blair Wallis was the leading scorer with 17 points, while Tate Walters added 15 points and Preston Reid added 14 points. Many Lady Wolves contributed on this special night. Our seniors and parents were recognized between the girls and boys game with Miss Ebony Grant, Miss Preston Reid and Miss Casey Jones being honored for all their hard work and dedication to our program through the years. It was a great ending to a very successful regular season. Great job ladies!! The Lady Wolves will play the winner of Cedar Shoals and Walnut Grove this Thursday Feb 7 at 4:00 at Walnut Grove. Please come out and support our ladies as they prepare for another fun filled region tournament bracket.